Dinosaur Safari – described as the biggest, most realistic dinosaur ride in America – will open to the public on April 19. The immersive experience allows visitors to experience a two-acre wooded area of the Bronx Zoo among 40 realistic and life-sized animatronic dinosaurs. The exhibit will include two massive 40 foot long Tyrannosaurus rex, an Omeisaurus, a herbivore spanning 60 feet from head to tail, as well as the Spinosaurus, one of the largest carnivorous dinosaurs, according to WCS Zoos and Aquarium, which owns the Bronx Zoo. In order for the animatronics to represent each dinosaur species accurately, including its motions, vocalizations and appearance, Carl Mehling, a paleontologist at the American Museum of Natural History, as well as “Dino” Don Lessem, a dinosaur expert, author and advisor on the production of the original Jurassic Park film, was brought on board by the Bronx Zoo as consultants. “The Dinosaur Safari experience is twice the size of past Bronx Zoo dinosaur exhibits,” Jim Breheny, Bronx Zoo Director and WCS Executive Vice President of Zoos and Aquarium, said in a statement, adding: “It’s a thrilling experience and a learning one, too." 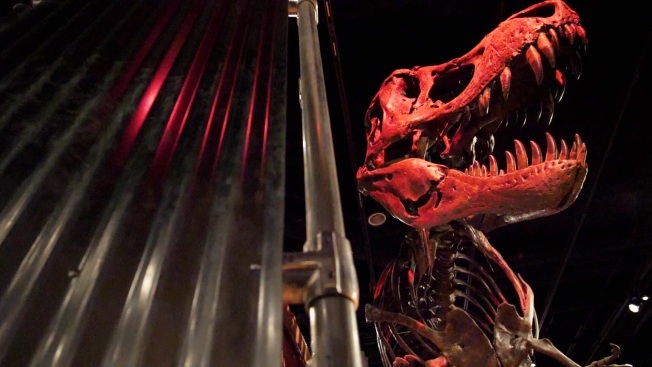 According to Breheny, the immersive experience highlights the behaviors and characteristics that helped dinosaurs and wildlife develop adaptations to help them survive in their native habitats. The ride concludes with an ADA-accessible fossil dig area. There will also be photo opportunities and dinosaur-themed activities throughout the zoo. The safari will run from April 19 to Nov. 3 and will be included in the zoo’s Total Experience ticket.